Author Joyce Trainor writes and weaves, and loves on her grandchildren and 92-year-old mother, from her home in northern New Mexico. Joyce didn’t start out to be an author, but an encounter with a homeless man sparked the story idea that became her first book, No Handbook for the Homeless: A Novel (Sunstone Press, 2015). 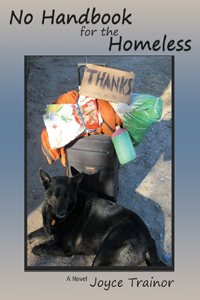 What is your elevator pitch for No Handbook for the Homeless: A Novel? A middle-class woman, overcome by debt caused by a drunk-driving accident, loses everything and everyone except her deceased son’s Belgian Shepard. The two must learn to survive among the homeless as she slowly rebuilds her life. I want readers to gain a new perspective when they see a homeless person, one filled with empathy—there but for the grace of God go I. I also want those who read the book to think it was time well spent. Tell us a little about your main characters. Did they surprise you as you wrote their story? Aileen, the narrator, is an ordinary person who finds herself in extraordinary circumstances. She is both mystified and terrified by what is happening. The other major characters, Wizard, Cesar, Father Rico, and Billy Dean all developed as I wrote the story. Occasionally, I wrote a scene, read it back, and decided it was something that would never have happened with that character—and it was back to the keyboard. Wizard especially was looking over my shoulder to make sure I got it right, and believe me he is opinionated. Billy Dean was pure fun. Everything about him still makes me laugh. And then there is Peanuts. His picture is on the cover. A lot of my readers became emotionally attached to him. They expressed more concern for the dog than Aileen. How did No Handbook for the Homeless: A Novel come together? I have to begin by saying the book is not autobiographical. I am blessed with a wonderful home, family, good friends, and neighbors. But it’s based on things I’ve observed in the world around me. The story began as one of those “I wonder” moments. My husband and I were stopped at an intersection and a homeless man was panhandling. He held up a sign to about every third car, but he was agitated, walking in circles, talking to himself and trying to cope. For the next few weeks he stayed in my mind. I wondered who he was and how his circumstances led him to that street corner. I wondered what my life would be like if I found myself without a home. It took a few more months before I wrote my first chapter, which I later moved to the middle of the book. From there the book took off. I wrote a chapter at a time, not always in chronological order. It took two years to write and rewrite the book and another year to find a publisher. I received dozens of rejections before Sunstone Press picked it up. I’m inexperienced when it comes to the business end of books and publishing. I was lucky to have a mentor, Santa Fe author Robert Mayer. He was generous with his advice. I needed to make the situations believable but also respect the reader. That is, I wanted the reader to feel an emotional connection with Aileen without betraying her thoughts. Some of the chapters were incredibly hard to write and rewrite. For example, the Christmas Eve and Christmas morning scene at the motel, I wanted to engage the reader without being overly sentimental. I paid a lot of attention to the details that set the scene, the little things, like spirals of snow in the stairwell. Why did you choose New Mexico as the setting for the novel? It’s a New Mexico story, but it could easily have been set in another state except for the weather. The weather is a key element in the story and helps drive the plot. You have to remember the impact weather has on the homeless. If it rains or snows or winds are thirty miles an hour, the person on the corner has no place of refuge. Most shelters are only open part of the year, and only at night. The people who stay there have to be up and outside early in the morning no matter what. Once the book was published and people started to read it, I got a tremendous amount of feedback from readers who told me it changed their way of thinking. They do things they never would have before, like buy an extra hamburger and give it to the man or woman standing on the corner. There are a number of deaths in the book. They were emotionally draining for me. I cried with my characters. I knew what was about to happen but couldn’t bring myself to write it down. I would write around it until I was in a mindset that allowed me to finish the chapter. I love good storytelling. Tony Hillerman, Barbara Kingsolver, James Lee Burke, John Grisham come to mind immediately. I appreciate the way they use setting to drive the plot and characters and the way they engage all five senses. I weave. I have two Rio Grande walking looms at home, and I love the feel of the wool as I weave. It’s gratifying to see the design develop from tiny threads set in just the right place. I find it very meditative. I do some of my best writing while weaving a rug. I’m in the rewrite stage for another novel, Code Name Simpson. It’s a spy story set during World War II. It’s loosely based on my mother’s experience as a WAC assigned to a secretarial pool in Germany during the waning days of the war. Times being what they were, she was called upon to serve in a classified capacity. I may decide to self-publish this one because Mom is about to turn ninety-two, and I want her to be able to read it. If I wait to find a publisher, and then get it into print, that may never happen. I can’t wait to apply what I learn from SWW’s Self-Publishing Conference in October.